Please help us spread the word about this important event by sharing the flyer shown here by sharing with friends, family members, co-workers, or anyone you think will benefit by attending. There are share buttons on the left side of the page to make it easy for you to share on your favorite social media sites. You are cordially invited to a FREE event on Tuesday, May 24, 2016. 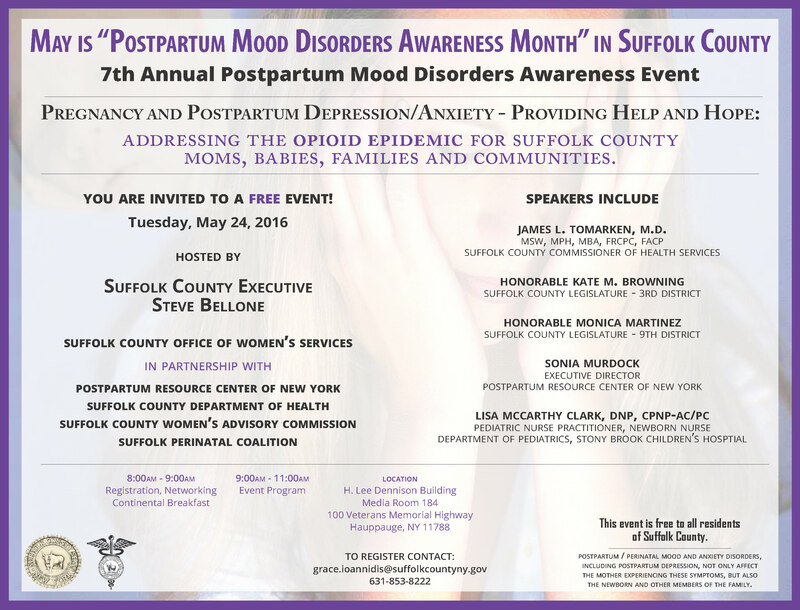 The topic of this 7th Annual Postpartum Mood Disorders Awareness Event is: Pregnancy and Postpartum Depression/Anxiety - Providing Help and Hope: Addressing the Opioid Epidemic for Suffolk County Moms, Babies, Families and Communities. Hosted by Suffolk County Executive Steve Bellone, Suffolk County Office of Women’s Services in partnership with the Postpartum Resource Center of New York, Suffolk County Department of Health, Suffolk County Women’s Advisory Commission and the Suffolk Perinatal Coalition. This event is free to all residents of Suffolk County. Health Care Providers, Mental Health Professionals, Faith Based Organizations, Community Outreach Organizations and Public Servants are encouraged to attend this important event.